Barkley L. Hendricks: Birth of the Cool accompanied the first career retrospective of the renowned American artist Barkley L. Hendricks, curated by Trevor Schoonmaker at the Nasher Museum of Art at Duke University from February 7, 2008 through July 13, 2008. Hendricks was born in 1945 in Philadelphia. His unique work contains elements of both American realism and postmodernism, occupying a space between the portraitists Chuck Close and Alex Katz and the pioneering black conceptualists David Hammons and Adrian Piper. Hendricks is best known for his life-sized portraits of people of color from the urban northeast. His bold portrayal of his subject's attitude and style elevates the common person to celebrity status. 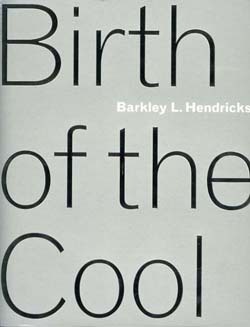 Cool, empowering, and sometimes confrontational, Hendricks' artistic privileging of a culturally complex black body has paved the way for today's younger generation of artists. This richly illustrated book contains 100 color images of paintings created from 1964 to the present. It focuses primarily on the artist's full-figure portraits, as well as lesser known early works and the artist's more recent portal-like landscape paintings. The catalog includes the most comprehensive biography and bibliography on Hendricks to date, a timeline of the artist's life, and an interview with the artist by Thelma Golden, Director and Chief Curator at the Studio Museum in Harlem. It also includes essays by Barkley L. Hendricks, Duke University art historian Richard J. Powell, exhibition curator Trevor Schoonmaker, and Franklin Sirmans, Curator of Modern and Contemporary Art at the Menil Collection.